This story was written by CBSNews.com's Lloyd de Vries. Next year's U.S. stamps will be emphasize heroes - real and imagined. Ten stamps will highlight comic book superheroes like Superman and Batman but there will also be stamps for bats-men: baseball sluggers. "There's been a lot of requests for a Mickey Mantle stamp, and we wanted to go a little bit beyond that, and highlight some of the other great sluggers," Dave Failor, executive director of Stamp Services of the U.S. Postal Service, told CBS News.com. 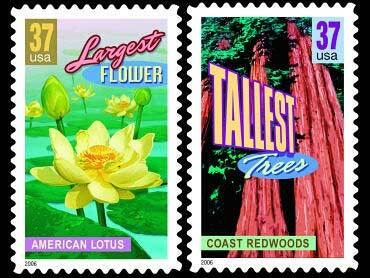 CBSNews.com's Lloyd de Vries gives an audio report on the upcoming new stamps. The other players are Mel Ott, Roy Campanella and Hank Greenberg. Other heroes on next year's stamps include Benjamin Franklin, born in 1706. The four stamps will note Franklin the Scientist, Franklin the Printer, Franklin the Statesman and Franklin the Postmaster. "He was such a varied individual that we thought that if anybody needed to be featured in a block of four stamps, Benjamin Franklin would certainly be the right subject matter," said Failor. But Franklin isn't the only American diplomat on the 2006 stamps: Six professional diplomats, chosen on the advice of the American Foreign Service Association, will be featured in a six-stamp "souvenir sheet." They are Hiram Bingham IV, who saved many French Jews from the Holocaust; Francis W. Willis, the first woman U.S. Ambassador; Charles Eustis Bohlen, a specialist in Soviet affairs who served as the Russian translator for Presidents Roosevelt and Truman at the Tehran, Yalta and Potsdam conferences during World War II; Robert D. Murphy, a top aide to President Roosevelt during World War II and later as Ambassador to Belgium and Japan; Clifton R. Wharton, the first black U.S. Ambassador; and Philip C. Habib, who held top posts in the State Department and was called out of retirement by President Reagan in 1981 to prevent war in the Middle East. Diplomats is one of four issues coming out during the major international stamp show in Washington next year. The others are a sheet reproducing classic issues of 1922-23 (Lincoln Memorial, U.S. Capitol and the Freedom statue atop the Capitol Dome); a joint issue with Canada celebrating the exploration of Samuel de Champlain; and Wonders of America, which evokes the classic tourist postcards of the mid-20th Century with 40 stamps titled "Tallest Dunes," "Biggest Flower," "Windiest Place," and so on. Also on the lighter side are two entertainment issues sure to please film aficionados: The 12th Legends of Hollywood stamp subject is Judy Garland, featuring a publicity shot from "A Star Is Born" (1954). The 2006 Black Heritage entry honors actress Hattie McDaniel, the first African-American to win an Academy Award (for "Gone With The Wind," 1939). The Postal Service notes that she worked hard to "change the [film] industry from within, as far as the discrimination that African-Americans felt." Katherine Anne Porter, author of Ship Of Fools, is the Literary Arts subject in 2006. She won both the National Book Award and Pulitzer Prize for her Collected Stories and was nominated three times for the Nobel Prize for Literature. And she was the great-granddaughter of Daniel Boone! The year will start off with eight stamps of Favorite Children's Book Animals, a joint issue with Britain and Olympic Winter Games (a skier). The exact order of next year's stamps is somewhat up in the air, because of a pending rate increase request. Not only does the Postal Service's Stamps Services division not know exactly when the rate increase will go into effect - early January is most likely - the USPS may withdraw the request if it gets the legislative relief on pensions that it has requested. Other issues slated for 2006 are two new wedding stamps, in one- and two-ounce denominations; The Art of Disney: Romance; boxer Sugar Ray Robinson; Amber Alert; American Motorcycles; Quilts of Gee's Bend; Southern Florida Wetland; Holiday Snowflakes; and a new religious Christmas stamp, based on Chacón's "Madonna and Child with Bird" painting at the Denver Art Museum.